Richard T. Arnold was born in Indianapolis, Indiana, but came to school in Southern Illinois, where he lived as a guest in the old Thompson house (now a depression in the ground in Thompson's Woods just behind the south wing of the Student Center). He received his B.Ed. degree from Southern Illinois Normal University in 1934 and went on to the University of Illinois for his M.S. and Ph.D. degrees in 1935 and 1937. Then he started an academic and industrial career which eventually ended at Southern Illinois University at Carbondale. Along the way, he moved through the ranks at the University of Minnesota from Instructor to Full Professor, 1937-1946. He was Chairman of that Department of Chemistry, 1946-1955, (with a brief stint as Scientific Attache to the U.S. Embassy in Bonn, Germany from 1952-1953) until he became Program Administrator of the Alfred P. Sloan Foundation, 1955-1960. 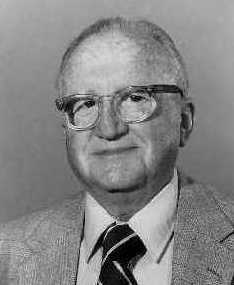 Next he joined Mead Johnson and Co. (1960-1970) as their first Director of Research, but soon moved up the corporate ladder, first as Vice President for Research and Development, then as President of the Research Center, and finally as Vice President and Chairman of the Scientific Advisory Board. Returning to SIUC, Dr. Arnold served as a Professor in the Department of Chemistry and Biochemistry (1970-1982) and as Chairman from 1970 to 1975. During this last period he was also Chairman of the Board of Organic Synthesis, Inc. The year following his retirement into Emeritus Professor status, he was honored with a Visiting Professorship at Northwestern University. Among Professor Arnold's many honors are the American Chemical Society's Award in Pure Chemistry in 1949, and Honorary D.Sc. Degrees from Northwestern University and Southern Illinois University. Professor Arnold was active in civic affairs, university and departmental committees, and published over 100 scientific papers.